Linksys Wireless-G Travel Router has a dimension of 4.2 x 2.9 x 1.2 inches and weighs 5.2 ounces. The travel router also incorporates Linksys’ SpeedBooster (AfterBurner speed boosting technology) to improve wireless performance. 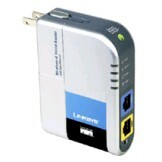 It supports both 802.11b and 802.11g WiFi and SecureEasySetup (SES) technology, which enables router to establish secure connections to computing devices equipped with an SES-enabled wireless notebook adapter, such as the Linksys WPC54G. Top Tech News rated Linksys Wireless-G Travel Router 4 out of 5 and gave the verdict that the Linksys Wireless-G Travel Router offers a convenient way for travelers to set up a wireless-access “bubble” wherever they go. While its uses in the home are limited by its range, the router is worth a look from road warriors. Pros: Both lightweight and compact; SpeedBooster increases wireless performance by up to 35 percent when linked to compatible devices; automated WEP and WPA encryption. Cons: The device’s internal antenna design approach acts to limit the available wireless coverage range.